Why "eggplant"? Apparently some 18th century European cultivars resembled goose or hen's eggs, so planters called them "eggplants." Eggplants have a long history. They are native to India where they were first cultivated over 4,000 years ago. During the Middle Ages Arabs introduced eggplant to the Mediterranean region. 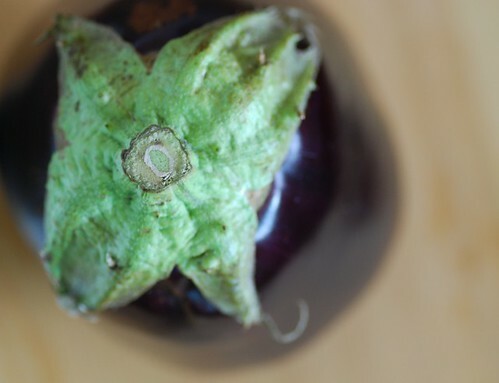 Eventually European explorers introduced eggplant to places such as Africa and North America. Today China, India, and Egypt are the world's leading producers of eggplant. How do you select eggplant? Look for glossy, richly colored skin that is free of dimples and bruises. Pick it up. It should be firm and heavy for its size. Gently squeeze it; it should give slightly. Avoid either rock hard or squishy eggplants. How do you store eggplant? Store unwashed, uncut eggplant in the crisper drawer for up to 2-3 days. Once you cut the eggplant, the flesh will begin to oxidize, or turn brown. That's okay. It's not bad, just not pretty. If, however, you cut into the eggplant, and it's already streaked with brown, or the seeds are blackened, then toss it. It's old. How do you prepare and cook eggplant? Rinse the eggplant with water, and cut off the green top. Use a very sharp knife; otherwise, the rubbery skin will make slicing difficult. Many people swear by "sweating" raw eggplant before cooking it; that is, sprinkling it with salt and letting it rest for 30 minutes, to remove the bitterness. I have done it and have never noticed any significant difference. To me, it's more important to by a fresh eggplant. Eggplant can be steamed, sauteed, roasted, broiled, baked, or grilled. What are the health benefits of eating eggplant? 1 cup of eggplant is only 27 calories and is a very good source of dietary fiber, potassium, manganese, and vitamins B1 and B6. What can you do with eggplant? Roast it and make dips such as baba ganoush or tomato-eggplant jam; grill it for a delicious appetizer; add it to salads, sandwiches, and soups; make caponata; add it to pasta, risotto, and grains such as farro; add it to lasagna; use it as a pizza topping; make a big dish of eggplant parmigiana. Of all the cooking methods, grilling may be the kindest to eggplant. The intense heat lightly chars the outside of the eggplant, lending it an irresistible smokiness, yet keeping the flesh deliciously tender and creamy. These Grilled Eggplant Napoleons are ideal for a dinner party -- they're a breeze to make yet make a grand impression. 1. Whisk all dressing ingredients in a small bowl; set aside. 2. Preheat grill to medium high. 3. Brush eggplant slices with olive oil, and sprinkle generously with salt and pepper. Place on a hot grill that has been lightly oiled. Grill eggplant for 5-7 minutes per side, or until tender and lightly charred. 4. To assemble stacks, start by placing an eggplant slice on a plate. Top with a slice of cheese, then tomato, then basil. Repeat one more time. End with a slice of eggplant. Repeat with remaining ingredients until 4 stacks are made. Drizzle with dressing, and serve immediately. Add slices of roasted red pepper. Add olive tapenade in between layers. For even more delicious eggplant recipes, check out my article on Foodie View: "Every Kitchen Needs Some Black Magic: Cooking With Eggplant." I often have a love/hate relationship with them...but I do enjoy them most of the time! The Napoleons look really easy and delicious! Beautiful recipe! I am loving grilled eggplant this summer and am consuming mass quantities- this looks so good that it may have to be my next option. Yum! I've found out there are a lot of eggplant avoiders out there. I am definitely not one of them. One of my favorite ways with eggplant is to roast it in the oven with lots of olive oil and garlic. Then I toss it with pasta, cream, and tomatoes. those are next to ripen in my garden. We have white ones this year. These look gorgeous - and delicious as well. :) Great article! Perfect timing! I've noticed a lot more eggplants in the store lately and have been using them quite a bit. Just yesterday I made a spinach salad with roasted eggplants and miso dressing and it was awesome. The photos are so pretty, Susan! All the tips are nice, too. I always love eggplants, but sometimes they do not love me (when I fried them). Lovely and easy recipe! I love that this is so easy and so beautiful! I'm having guests for dinner next week and this is going to be our first course! Thanks, Susan! Thank God for eggplants! :-D Lovely "top" shot! Unusual.. Your photography is so beautiful (and mouthwatering!). I love the Napoleon idea - this week I made Fine Cooking's wonderful recipe for roasted ratatouille that used up all my CSA eggplant. I love eggplants. Your napoleon sounds delicious. I may have to give that a try. I just finished eating some roasted eggplant spread. I love melanzane. Your recipe looks delicious! Great eggplant primer! I'm partial to the thin Asian eggplant, as it has almost no seeds. I'll also add that for some people, nightshade vegetables like eggplant can sadly be inflammatory and often linked to arthritis. Thanks for the great info! I must admit I've been guilty of using old eggplant many a time. It helps to buy the thin Asian variety though - seems to be less bitter/seedy. Also, I just bookmarked your eggplant parm recipe - thank you for posting a healthier option. What a beautiful preparation of eggplant! We would love to have this recipe on Recipe4Living.com! Fabulous advice!! I always say I want to cook with eggplant more and this might be just the motivation I need!! peterg-For me, it was love at first bite. theleftoverist-Mmm... I'll have a plate of that, please! stephanie-Ooh, the white ones are so lovely! cate-Oh, that salad does indeed sound awesome! chris-Yay! I'm happy to hear it! foodhunter-I'm so glad you like it. soma-Thanks. Eggplants aren't that easy to shoot! nanette-I really appreciate that. Thank you! And ratatouille sounds perfect. I've gotta make some now. Thanks! culinography-That's the kind of work I crave! lydia-I love them with a soy sauce and ginger glaze. xiaolu-You're so welcome! And thank you for the post. wanm-Glad to be of assistance! aparna-I agree. Thanks for the boost! 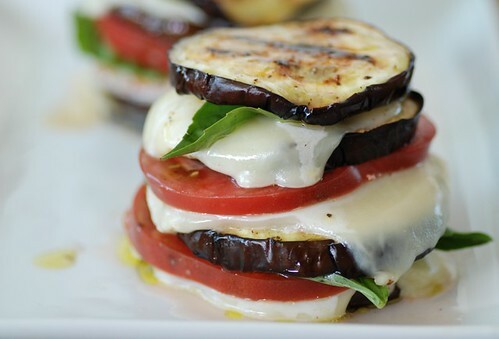 That is a gorgeous stack of eggplant, and the cheese is drool-worthy! I like melanzane for its name because that's part of the name of my favorite pizza. Thanks for all the tips. Gee, that first photo is fabulous. eggplants are one of my fav. yummm!! this one sound mighty tasty.. a must make! lisa-Oh, I love that pizza too. mora-It really is a must make! phoebe and cara-It's easy to get crazy with it, isn't it? wizzy-You're so welcome! They are really low-maintenance.